At any given time there are about 80 different cars on display at the Porsche museum in Stuttgart. That might sound like a lot, but it's just a small fraction of the more than 600 vehicles in their overall collection. In addition to the cars on display, the team at the Porsche Museum handles the deployment of over 200 vehicles to more than 30 countries as part of Porsche's "Rolling Museum". Now, for the first time, in a new exhibit, the museum curators are Porsche fans a glimpse behind the scenes: from vehicle deployment planning to appearances by celebrity drivers and preparing tours, visitors can get an impression of the strategic and logistical challenges involved. The Porsche Museum is at home not just at the company headquarters in Zuffenhausen, but all over the world. The cars in the museum's collection are not just displayed in Stuttgart, but are exhibited around the world as brand ambassadors. The “rolling museum” travels all over the world 365 days a year. Each year, as mentioned above, the museum handles over 200 vehicle deployments in more than 30 countries. 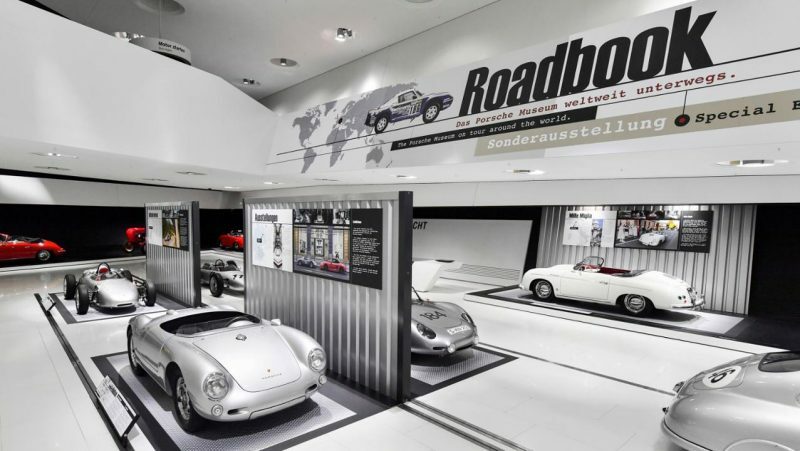 Roadbook's 21 impressive exhibits inform visitors about the transport and logistics of these priceless cars by land, sea and air, as well as technical preparations and follow-up tasks for all sportscars with the Porsche crest on the bonnet. Another attraction is the 911 model from 1966, which was photographed “Around the World” in front of earth's most famous landmarks in 2013 as the “eleven” celebrated its fiftieth anniversary. The special exhibition also features the 911 Carrera RSR, which took part in the Targa Florio on Sicily, the 911 SC Targa, a competitor in the “Top City Classic China Rally”, and the 356 A 1600 Speedster, which toured the coast roads on the west coast of America as part of the “California Mille”. The special exhibition will run from today until April 23, 2017, including on the upcoming German public holiday for "All Saints' Day" on November 1, 2016.